No matter where we start our search for tiles, we usually always end up at Saltillo. They consistently have styles of tiles I don't see anywhere else. 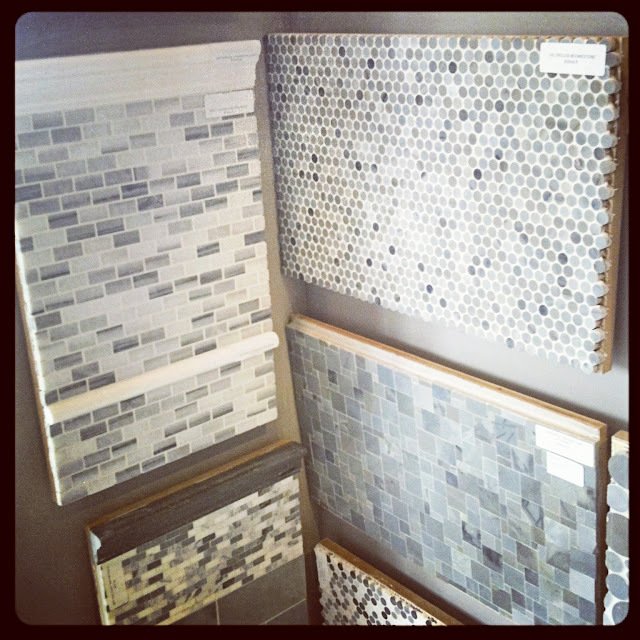 Its no wonder that they are Sarah Richardson's go-to-place for tile too. Their marble mosaics make me swoon. See? Delicious. I was loving these ming green ones in particular. Great patterns. Hmm, maybe for the laundry room? 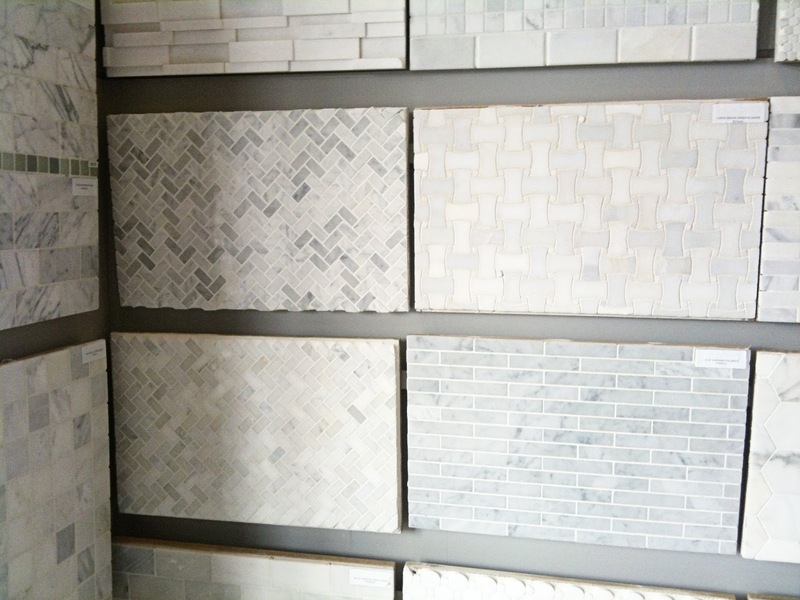 We're on the hunt for tile for the laundry room and the basement bathroom. 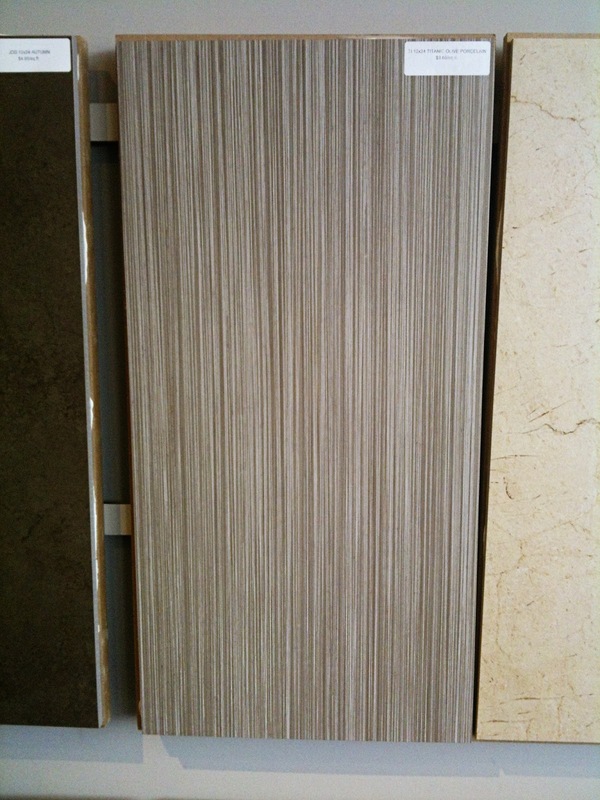 I've settled on this striated tile for the floors in both rooms. Its long been a favourite - neutral, a bit of an organic feel - and it will feel incredible with the electric floor heating, courtesy of Nuheat. We put in-floor heating in our bathroom upstairs, and seriously, it is was the best decision ever. Once you go heated floors, there's no going back. Trust me on this. The shower walls, though, are giving me a bit of a headache. We're going to do subway tile for part of it, but we need to kick it up with something else. Maybe an accent band or an accent wall in a mixed glass and marble mosaic? But that look has been done so many times before. I'm getting a little tired of the accent band... but what else should we do? 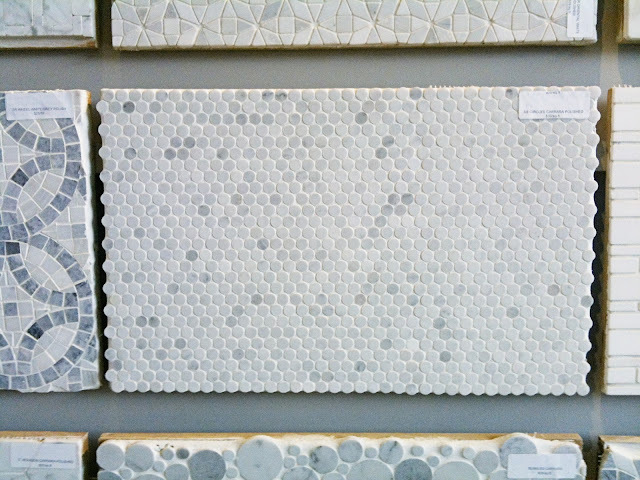 These Oriental White marble mini tiles in a grid pattern were calling to me. Such an unusual shape and size. I love these ones too... marble penny tiles but super-small, only 3/8" round. I'm thinking shower floor. The texture would feel like a massage for your feet. 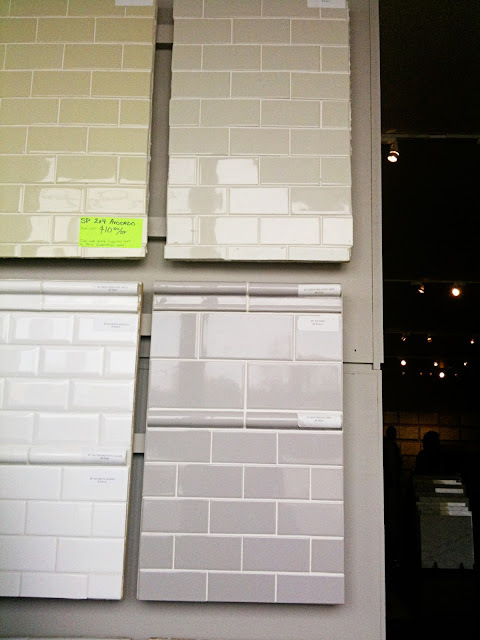 And these coloured subway tiles keep catching my eye. I'm digging the top right sagey green one. The tiles have a milky kind of look and feel very retro. I quite like how they've styled the grey tiles too, with the 1/2 round pencil tile and mix of sizes. Its a great way to add some pizzazz when you're working with basic tiles. So many choices! We didn't pick anything up on this trip, but you can bet we'll be back to the tile store soon. I think you should do a full accent wall behind the vanity like SR did recently. I will hunt down the pic! Oh my gosh - major tile envy happening over here. 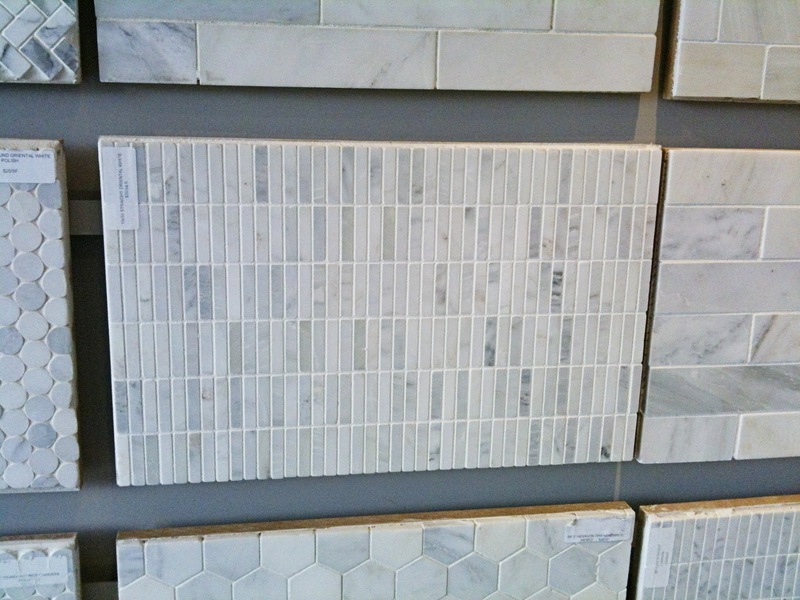 We're sticking with plain ol' white subway tile for our shower, with black accent bands. But, we live in a century farmhouse so I think it's okay that we're doing something a little more traditional. So many options. This is going to go great in my bathroom with the radiant floor heating I'm putting in. Why not put down some radiant floor heating in your bathroom! What I think is timeless and classic is varying patterns of the same tile. My Aunt has large (floor size tile) on the horizontal until about 5ft up. Then there is a band of subway sized tiles above which the same large scale tiles however they are set on the diagonal. Its clean, its interesting, but what I love about it most is it will never go out of style. I'm excited to see what you decide, since I'm pondering the same questions right now. I've always been envious of Toronto's Saltillo selection! Gorgeous selection! I was always salivating when Sarah would visit that store. So many beautiful choices. I'm not tired of accent bands yet, but if you're not into it you're not into it. I love the penny rounds and all the mosaics. It is a lot of grout lines though. 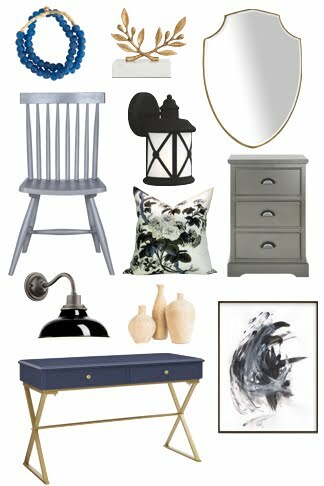 This was the inspiration we used for our two baths and they turned out beautiful. 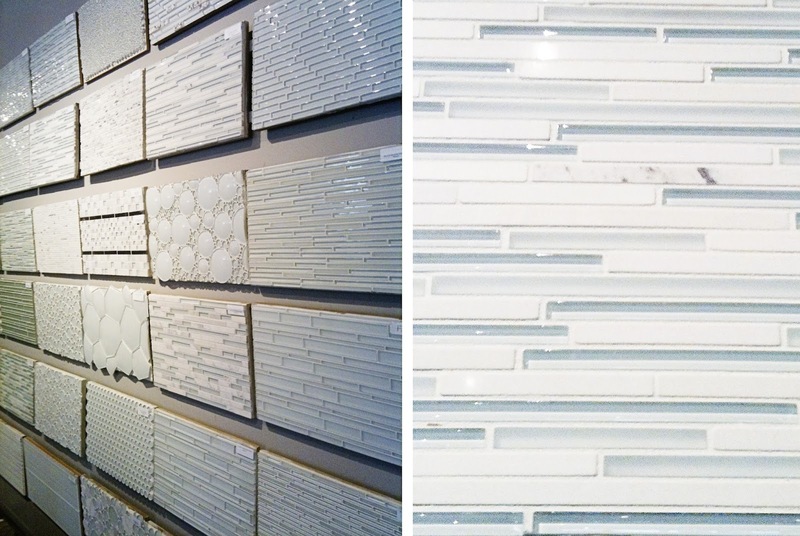 The marble mosaics make me swoon too Jennifer! I love it all....so I think you'll be safe with any of these beauties. Good luck with your decisions. Rona has very similar striated tile than the one you show here, I think the name is Mono Serra - and they often go on sale. 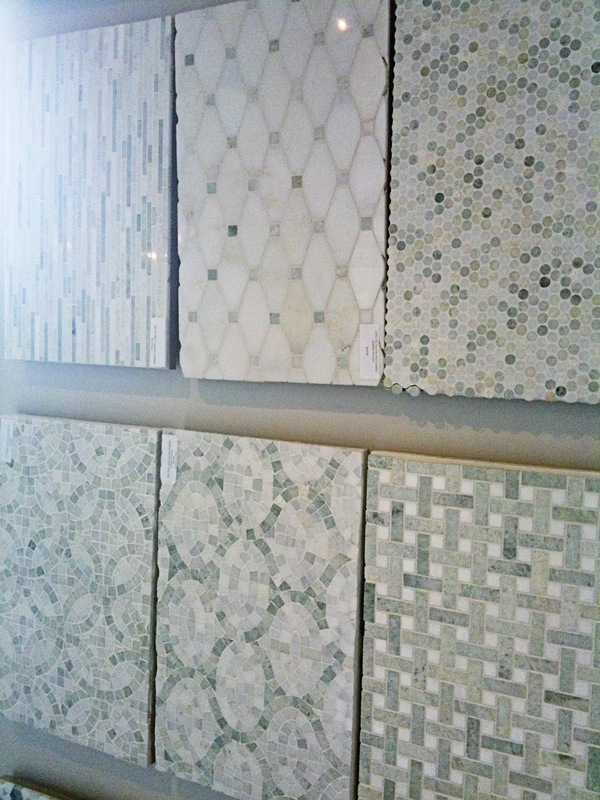 Always overwhelmed when I go to the tile showroom....so many fabulous options! 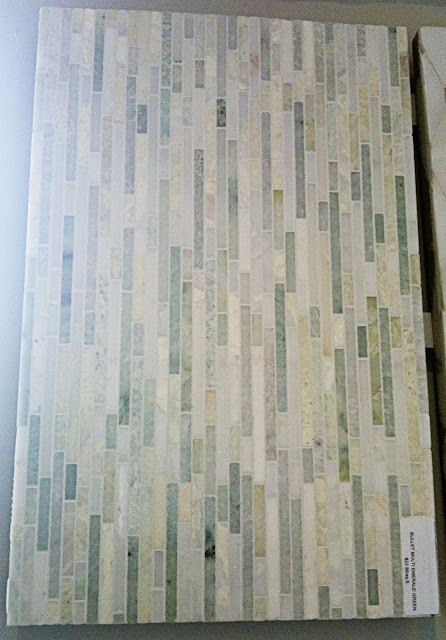 Oriental White marble mini tiles in a grid pattern looks very nice... if you are looking for Electric floor heating... visit us for better heating systems. hm ... tough question. Instead of accent band, maybe using one material as solid on one wall is still the way to go. But to bridge with the subway tile on both sides, you probably still need a band or two. I have done the accent band and now I wish I had done the entire wall with the accent tiles. More $$$ but so worth the investment. I love the penny round too and my only concern is more grout = more to clean. Now here is an idea: how about mixing those oriental tiles with the penny round for an accent band? (i.e. 2 bands of oriental tile sandwiching a band of penny round or a using penny round to sandwich a couple bands of oriental ones), then use penny round & other tiles on the floor for an interesting pattern, and oriental mini tiles for accent wall? Wow, I've seen a lot of tile in my day, but never that breadth of marble mosaic options. 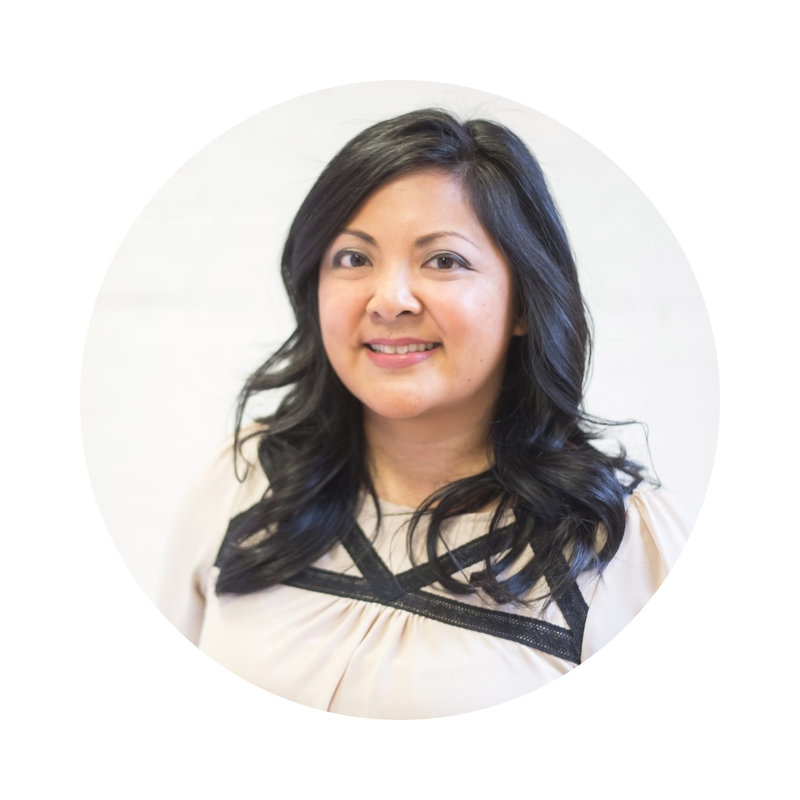 You're a lucky lady to have such a great resource! I always like traditional shapes in unusual patterns like the mini grid in stacked bond you suggested above. In our shower we have large subway tiles (4x16) run vertically with dark grout, and we love it! I'm actually drawn to the lemongrass colored subway tile to the left of the sage you like. Can't wait to see what you pick. Go crazy! Personally, I'd go with BIG tiles - less grout to clean! -- I've always loved those slate ones Mike Holmes used to use... However, if You *really* wanna BLOW your Budget, how about a Custom mural done in Glass? I'm thinking that seaglass/recycled blue-green with little coloured "fish" imbedded... I'm sure that Chloe would always want to take a shower with the fishies! It would be seriously cool in the laundry room! Or think about accent bands as in plural, more than one. You could add the oriental white mini tiles as horizontal accent bands but installing three or five, etc....to create an overall graphic pattern (subtle tone-on-tone or high contrast/textured depending on the accent tile chosen). I know what you mean about the accent band having been done so many times before...that's why I didn't put any in my house. I figured a tiled wall is kind of just a backdrop for everything else going on in the room, right? Btw, my kitchen has beige subway tile very similar to the top left in your last picture. I LOVE LOVE LOVE the tiny marble penny tile (dime tile?). Can't wait to see what you choose! Instead of an accent band, why not use the accent in the shelf area of the shower, or a vertical stripe, or a square area around the shelf (that is if you are going to have an inset shelf area). I think it may have been Sarah that I saw do just the back wall in her accent tile and then the side walls were subway tile. So many options! I'm a fan of the subway tile- so classic and chic all rolled into one- love the green and that bottom grey. A word to the wise, I have the small octogons on my floor and I haven't been thrilled with them- a few have popped out and they're hard to clean- also, I'd definitely do some kind of banding/border around the edge if I was going to do them again- otherwise, they look kind of unfinished when they meet up with the wall tile- I'm actually thinking of ripping mine out and starting over- just not holding up very well.